Spring soccer season started this weekend, so here is Carter at his first game. It was a beautiful day and he had alot of fun and even scored a goal. Carter is the boy to the far right. Carter, Abby and Daddy practicing before the game. In the afternoon, we went to visit some friends in Fort Mill that recently had a baby boy. (I am sorry, no pictures of that). Then we went to this Greenway/Park. It was beautiful and the kids had a great time running around. Daddy, Abby and Carter heading back to the car. Carter's school celebrates St. Patrick's Day with a parade around the block. His entire class wore green tye-dye shirts and then they said that the kids could decorate something to pull. Carter wanted to decorate his wagon to look like a firetruck. So the work began for mommy. Some of his classmates are gathered outside before the parade. Here is Carter and some of his friends pulling the firetruck. The class is 13 boys and 3 girls, so the boys were thrilled. Carter and his friend Smith. They were the line leader and door holder. Big jobs for 4 year olds. It was a group effort for these boys. Carter with his "firetruck float". In the afternoon was the class party. I was one of the parents helping with the party today. Here is a close up of Carter. Carter at the table enjoying treats with some of his classmates. 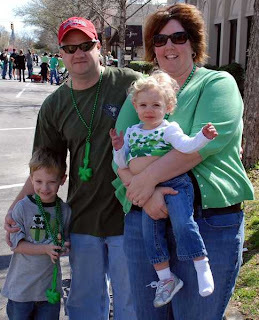 Today was Columbia's St. Patrick's Day Parade, so off we went. It was a beautiful day and the kids had a great time. The local newspaper took our picture and posted it online and here it is. Not too bad, just a little windblown. Carter waiting for the parade to begin. There was alot of political floats involved and Carter got to enjoy lots of the stickers. Abby waiting for the parade to begin. Carter and Abby together. Not the easiest of pictures right now. The weather was pretty and Patrick had to work (on his birthday), so I took the kids to the zoo this morning. They had a great time. The big brother, helping Abby out. Not sure what they are looking at, but it must be really cool. Carter on the rocks near the penguin exhibit and Abby walking.. The baby giraffes. The one in the back is leaning down, but it was born 3 weeks ago. The other is 7 months old. Amazing. Carter looking at the elephants. Abby being silly. She is really good at that.